Tanushree Dutta sexual harassment is stirring loud and big, Tanushree also accused filmmaker Vivek Agnihotri of sexual harassment and ‘Inappropriate Behaviour’. Former Miss India Tanushree Dutta has shaken Bollywood with harassment charges against well-known actors and filmmakers that she holds responsible for her abrupt departure from the industry. By doing so, Tanushree has opened the flood gates of the ‘#MeToo’ movement in Bollywood. While several actors are supporting her, accused Nana Patekar has finally responded. In a recent interview with ZoomTV.com, the former actress called out Nana Patekar for sexually harassing her on a film’s set some 10 years ago. Tanushree even holds Nana Patekar responsible for vandalizing her car and a film set while she was filming. If this was not enough, Tanushree has even called out choreographer Ganesh Acharya, director Rakesh Saran and producer Sami Siddiqui as they became silent spectators while she was being harassed on the sets of 2008’s ‘Horn Ok Pleasss’. Nana Patekar is not the only reputable filmy personality that Tanushree Dutta has called out for making unwanted sexual advances towards her! In an interview with DNA, Tanushree has accused filmmaker Vivek Agnihotri for behaving inappropriately with her on the sets of 2005 film ‘Chocolate: Deep Dark Secrets’. The former Miss India recalls an incident where she was asked to strip and dance. However, Irrfan Khan immediately put a stop to the spectacle and assured Vivek that he could give his solo-shot without Tanushree’s help. The actress further stated that Suniel Shetty too stood up in her defence by telling Vivek Agnihotri that if needed he can give Irrfan the cues. While Irrfan Khan and Suniel Shetty defended Tanushree years ago, today too some Bollywood celebrities are supporting her. The voice of media person Janice Sequeria isn’t gone in vain and Bollywood has come in support of Tanushree Dutta. 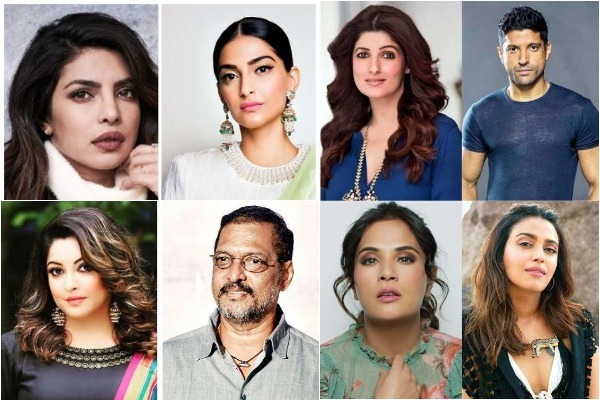 Actor and filmmaker Farhan Akhtar voiced his support for Tanushree by tweeting that her courage should be admired and her intensions should not be questioned. Priyanka Chopra seconded her ‘Dil Dhadakne Do’ actor’s opinion by tweeting that she believes in Tanushree. ‘Love Sonia’ actress Richa Chadda expressed her support by stating that it takes special courage to become like Tanushree Dutta. Sonam Kapoor came in support of Tanushree Dutta’s sexual abuse claim and retweeted Janice Sequeira’s tweet. Akshay Kumar’s wife Twinkle Khanna too came in support. Recently Indian-American model Padma Laskhmi opened up about being date-raped as a teenager, followed by other Hollywood celebs who broke their silence. Tanushree Dutta from Bollywoo is trying to bring #MeToo and #WhyIDidntReport movement in India. Eventznu wants people, irrespective of what gender and national you come from, to support #BelieveSurvivors movement. Become voice to the weak and raise your voice against the evil. Next : Did You Know Taimur Ali Khan’s Nanny Earns As Much As The Prime Minister?